These days, you’ll find that outdoor lighting is no longer an afterthought, it’s an integral part of any landscape and garden plan. Professionally designed and installed, it not only adds functionality and security to your outdoor areas, and value to your home, it can beautify your garden, create a cosy ambience in your outdoor ‘lounge’ or set the mood for a great night out in your own back yard! With sustainable garden and landscape design a top trend in the landscape industry, it’s no surprise to see LED lighting coming into its own. LED lights last longer than the traditional incandescent bulb and use less energy, saving you money into the bargain. They are also perfect for directional lighting, making them ideal for recessed downlights, spotlighting an outdoor cooking or entertainment areas, or lighting up a swimming pool or spa. Your party doesn’t have to come to an end when the sun goes down, and well-placed lighting will ensure you can make the most of your outdoor kitchen and entertaining areas long after the sun has set. 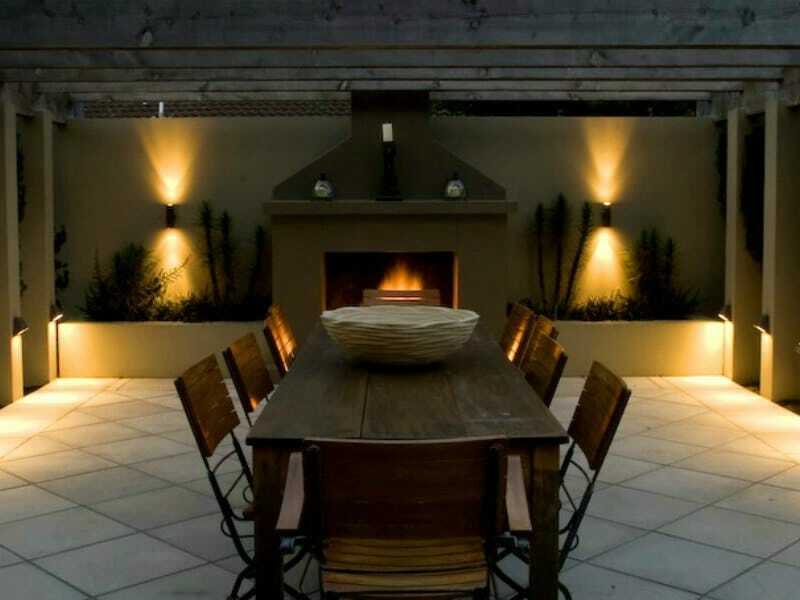 Create a cosy ambience with subtle accent lights around the outdoor lounge area, or set the mood for your dinner party with themed lighting for big game nights or special events. Fire and water features are a top trend in landscape and garden design this year, and if you’ve taken the time and money to incorporate them in your garden, professionally designed lighting will complete the picture. You can add sophisticated light columns or LED water arcs around a pool, accent a stunning waterfall feature, or add subtle lighting around the fireplace or fire pit to complement the flames. You can also use lights to accent your prize trees or shrubs, or to deepen their colour for effect. Landscape lighting can not only beautify your outdoor living area and garden, it will also add to the safety and security features of your home. With the right design and installation, landscape lighting can help prevent accidents and falls, illuminate dark corners and deter unwanted intruders. It doesn’t have to be dark for you to shine light on your garden! If you’re fencing for privacy but don’t want to block out light, consider using tempered glass panels that allow light through, or horizontal wood slats. Leaving space between the boards allows you to screen off neighbours while still allowing natural light in. In this digital era, most things are controlled by the tap of a button – and that includes your outdoor lighting system. The latest wireless lighting controllers allow you to use your smartphone, tablet or iPad to adjust the dimmers, turn the lights on around your pool and hot tub or create a stunning light show for your dinner guests. Lighting timers also offer efficiency benefits, helping you trim your lighting bill. Building a new home or planning a makeover of outdoor areas?